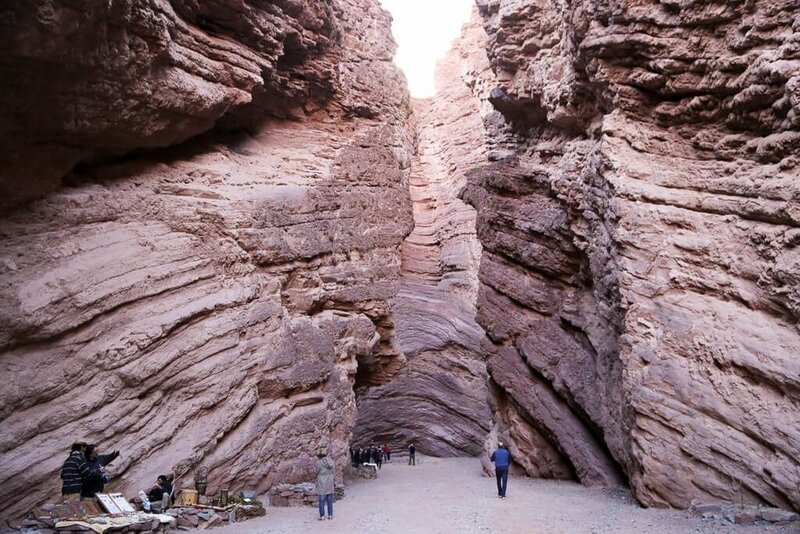 The Quebrada de las Conchas (or Shell's Gorge) is about an hour and a half south of the city of Salta in Northwest Argentina. 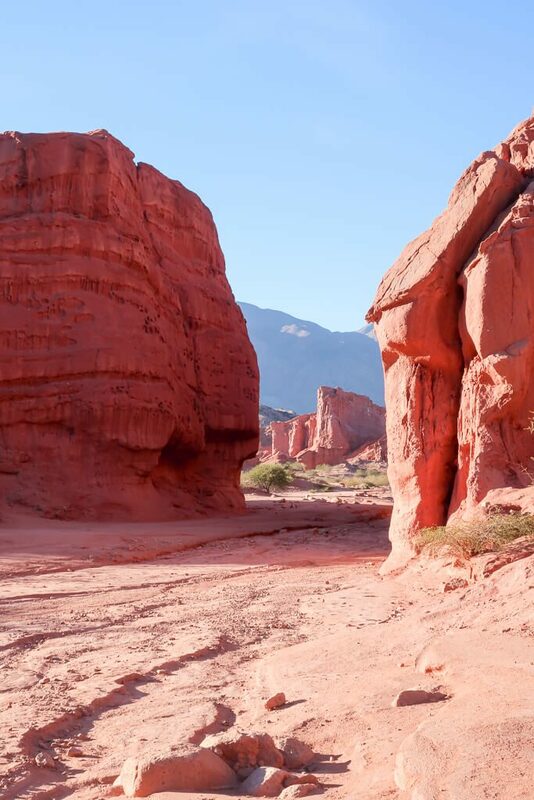 The Quebrada is part of the Calchaquí Valley, which is the entire region surrounding Cafayate to the south and reaching up to Salta in the north. This valley formed by the Calchaquí River is filled with beautiful, other-worldly geographical formations. While the entire valley is worth a visit, the star of the show is without a doubt the Quebrada de las Conchas. These 50 kilometers of Ruta 68, just outside of Cafayate, is one of the most iconic drives in Argentina. Wind, water and tectonic activity have transformed this landscape into unique geographical forms that, mixed with the red earth, will have you believing you're actually driving on Mars. There are a number of natural landmarks to see throughout the Quebrada. The two largest formations, the Amphitheater and the Devil's Throat, were formed by waterfalls slowly eroding the rock. Most formations are rocks that have been worn into the shapes of familiar objects like an obelisk or a toad. Here's a list of the landmarks to see along the way, beginning in Cafayate. This obelisk is a little underwhelming compared to the original in Buenos Aires. It's also a bit uninspiring as far as a geographical formation (isn't it just a glorified pile of rock?). Nevertheless, we stopped for the obligatory photo. You're welcome. La Yesera was one of our first stops. This land holds countless fossils of marine life that was deposited by a long-disappeared salty sea. If you have the time, you can take a 30-minute hike to the "Los Estratos". We didn't have the time, unfortunately, but I can only imagine that it's worth the effort. Ok, this formation is leaps and bounds better than the obelisk. Looking at it from this angle it is totally an enormous toad. It's a little more warped from the other end, but we can't all be perfect, can we? This parrot's home was actually pretty interesting! Parrots have made their homes in the niches in the rock (see above). They feed on seeds and plants in the region, proving that even in a desert, where there's a will to live, there's always a way. Ok, this one is just pulling my leg, right? I barely see the formation they claim is supposed to look like a friar, dressed in his robes. Can you spot him perched on top of the small cliff in the center of the photo above? This viewpoint was gold. There's a small parking lot to pull over and there will be a couple vendors selling touristy knick-knacks, so you won't miss it. Don't miss this photo op over the Calchaqui Valley below. We were lucky with the way the morning light bathed the valley in the most perfect light possible. The final two formations (or first two if you're coming from Salta) are the most stunning. Once inside them, you'll feel like you're being enveloped by the cavernous rock towering overhead. The amphitheater is very appropriately named. The acoustics are magnificent, and there are usually musicians inside playing local folkloric music. We were lucky to arrive at the same time as a massive tour bus. I have never said that before (and likely never will again). However, this particular tour group was a large group of Argentine retirees. They formed a dance party, singing and dancing with the musicians in the amphitheater. It was such a cool experience to watch. Such a menacing name and they seem to love it Argentina! There's a Devil's Throat waterfall in Iguazu and a Devil's Throat waterfall hike in Tilcara in Jujuy. The devil is everywhere! Well, this particular Garganta del Diablo isn't a waterfall anymore, but the remains of one long dead. This final formation is smaller than the Anfiteatro but no less stunning. You're allowed to climb up the rocks and explore inside the canyon. The sign says not to do it in sandals, but I'm a rebel who was too lazy to go back to the car for sneakers. This was my favorite place of the morning's drive through the Quebrada, so it was also a beautiful way to end it. From here, we continued north to the city of Salta. If you haven't seen Relatos Salvajes (Wild Tales) yet, then watch it immediately! You can stream it on Amazon here. It's an Argentine film made up of a collection of short films about situations where things get out of hand, very quickly. It's one of those films that makes you really feel the tension! One of the story lines was filmed here in the Quebrada de las Conchas. Obviously, we had to stop for a photo shoot pretending to be the characters beating each other up on the side of the highway in Salta. The best way to explore the Quebrada de las Conchas is slowly. Take your time and enjoy the views. You can, of course, rush through it just for the photo ops. But if you want to really take it all in, allow yourself half a day here. We drove the Quebrada de las Conchas early in the morning on our way back to Salta from Cafayate. I live for a good road trip and this particular drive did not disappoint. I was grateful to be in control (versus at the mercy of a tour guide on a schedule). We could pull over wherever we wanted, which was often, and take our time. And take our time we did, we spent the entire morning slowly crawling northwards through the Quebrada. Check rates here for rental cars in Salta. If you are staying in Cafayate, rental bikes are easy to come by. Hotels, hostels and tour companies on the main square all rent bikes by the hour. I'd have loved to do this if we'd have had the time. Ask your hotel or hostel for directions to the bus terminal located (like most things in Cafayate) very near the main square. The driver will let you store the bike in the luggage hold under the bus. 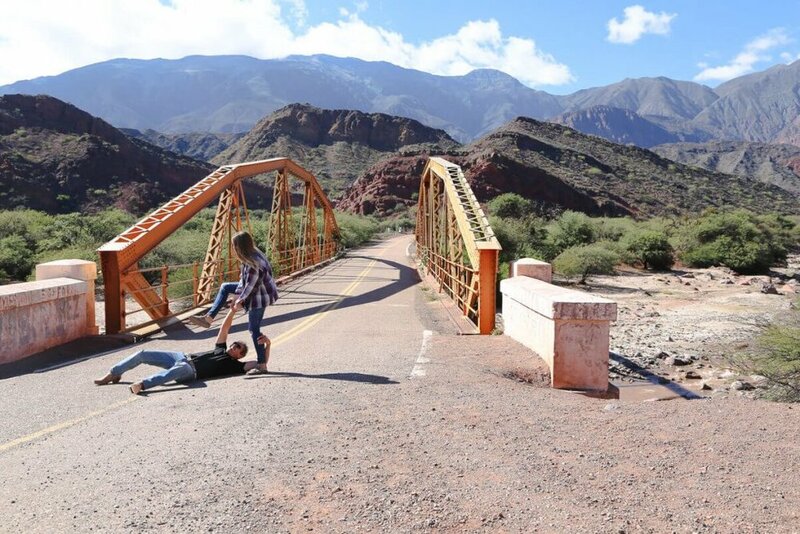 Take the bus to the Garganta del Diablo stop, and bike your way back to Cafayate, stopping at the landmarks along the way. The ride will take down 50 kilometers of smooth,well-maintained highway. Prepare for the desert sun with sunscreen, a hat and bring lots of water and snacks. Obviously, you could theoretically skip the bus and bike both ways, but don't be a hero. If you staying in Salta but still want to explore the Quebrada, there are great day tours available. A local guide will pick you up from your hotel and take you through all of the Quebrada de las Conchas highlights. The tour also includes visits and tastings to the Cafayate wineries to taste the region's native Torrontes varietal. If you're short on time and would rather not drive, this is a fantastic way to see everything in one day. Check rates and reserve your tour here. There really is a lot to see in this region, if you have the time to spare but still would prefer the luxury of a local guide, consider reserving this 2-day tour. On this tour, you can see the same highlights as the day tour but at a more relaxed pace. Your guide will take you through the Quebrada from Salta before enjoying wine tastings in Cafayate. After being dropped off by your guide at your Cafayate hotel, you'll have free time to explore the town on your own. The following day you're picked back up to return to Salta. Check rates and reserve your tour here.